Calm Before the Adam Storm! Thanks to @esselsari for Iphone background picture! Glam Nation Tour Pre-Sales for Wednesday, May 12 / New Dates Announced! Stay tuned for pre-sal information about these and other dates along the tour. I didnt realize how appropriate today’s title was going to be!!!! Adam Is Back on Jay Leno Friday May 21!!! “The Shaun Proulx Show” airs Thursdays at 7:30pm EST on OutTv (Canada). @AdamLambert & Betty White scheduled for June 11th appearance! 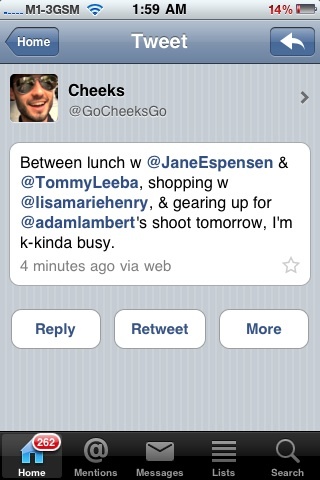 Cheeks is Gonna be in IIHY Music Video!! Hope more of Adam’s friends are in it! Who is going and who is going to cellcast? I like these! What about you? Name tags for all tweeters and AO members for the Glamnation tour! “Most of American Idol’s biggest stars aren’t, well, Idols. Sure, superstars Kelly Clarkson and Carrie Underwood lived up to their Idol titles, but the careers of top 10-ers like Chris Daughtry, Clay Aiken and Oscar-winner Jennifer Hudson have inarguably outshone the winners of their respective seasons. 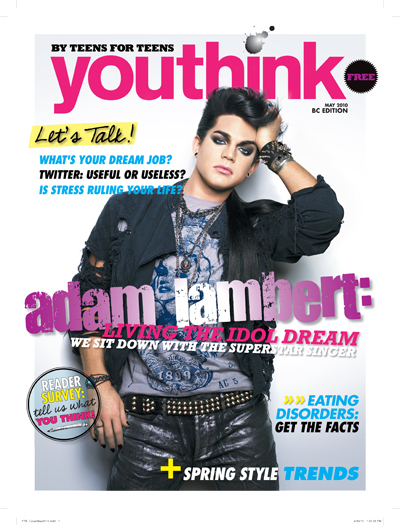 In fact, you may not even remember who won the last season of American Idol – but someone you won’t forget is runner-up Adam Lambert. You can listen to all the questions that have been uploaded! Some of them are good. Some of them, not so much. Let’s get some good, new questions for Adam onto the site! Rolling Stone Japan Magazine available…Um, sorry sold out again! Mission statement: Healing the world, one person at a time by spreading the awesomeness of Adam Lambert! New Contest Ends Friday May 14 so help me out! Thank you so much to all of you who have already submitted a banner! It’s going to be very difficult chosing one. I knew you guys would come through big time as usual! I would like a header or banner which includes my mission statement (above) to post at the top of my daily blog. It doesnt have to be fancy… a nice font and maybe a picture or whatever! So, what can you come up with? The winner’s name and masterpiece will displayed daily and I will also send you a personal gift..a surprise! You’ll like it…promise! Send any entries to me adamquotedaily@hotmail.com I will choose the winner next Friday, May 14 at 9:00 AM. All entries will be displayed if requested! Video Overview: This music video is set in a dark but beautiful forest, where we experience a surreal light show, similar to the Northern Lights of Norway. We are here for an artistic gathering of all types of people, to socialize, dance and party while taking in this display of beauty and mystery. Looking for people who can fire eat, fire breath, fire juggle, fire twirl, etc. Ages 18-30, male or female, any race, nationality. MUST ACTUALLY HAVE EXPERIENCE PERFORMING WITH FIRE. CAN’T FAKE THIS! Scorpios4Adam Fire eaters for the IIHY video?? What is with @adamlambert always wanting flames?? I think this would be funny with Bill singing WWFM and Pictures of Adam! I’ve never taken this close a look at Bill… If Adam likes him, he’s good for me! One day in January of the year 2009, I was watching American Idol, and it was the audition coarse of the show. I didn’t like any of the contestants that were appearing so far, but then they showed a man named Adam Lambert. He walked into the audition room and said, “Hey it’s Adam!” I didn’t know if I was going to like him or not, and I didn’t know how good he was going to be. I knew there was definitely something that was different about him, and I found him very unique. Then, as every week went on, and I kept seeing him; I thought to myself, “This guy has something special, but I just can’t pin point out what it is.” I thought his voice was amazing, and he had one heck of a range. I never heard anyone sing so good in my life, and then about the last Hollywood week, I really started to like him. He had amazing looks, and his voice was unbelievable. What more could you ask for? Then, as the competition began; I discovered that I had a major obsession over him! I realized he had the whole package, and he was definitely a worldwide mega star. I started voting for him excessively, and I could never stop! My Dad even made me hang up the phone because it was way past my bedtime! Adam made me feel happy everytime I saw him on American Idol, and I could never stop thinking about him. I just knew that I would always love him, and I kept saying to myself, “Am I falling in love? This guy is just super special!” I really adored him, and I never thought I would love anyone so much before. In the mid season of American Idol, they announced that there would be an “American Idols Live! Tour 2009.” I screamed and said to my parents, “OMG!! We have to go!! I want to see Adam! !” It would be extra special because I’ve never been to a concert before, and I wanted to have an amazing experience. My parents knew how much I wanted to see Adam, and they bought me tickets! I was so excited and it was my highlight of the summer! I couldn’t even describe my feelings! Every day I was shaking with excitement, waiting and waiting for that day to come. Every day I repetively asked myself, “Is it August 12th yet? I’m ready to see Adam!” Before I knew it, it was time!! All I could think about on August 12th was Adam. I wanted to meet him badly, but I couldn’t afford to buy meet & greet passes. My parents told me that the next time I get to see Adam that they will make sure I can buy meet & greet passes when Adam does his own tour. I felt happy then, but I was content with being able to see Adam live, and I was thankful for that. I couldn’t believe Adam & I were in the same room together! The feeling of that is simply amazing! I was screaming and flailing the whole time Adam was performing, and to be honest, I sounded like an Adam maniac!! 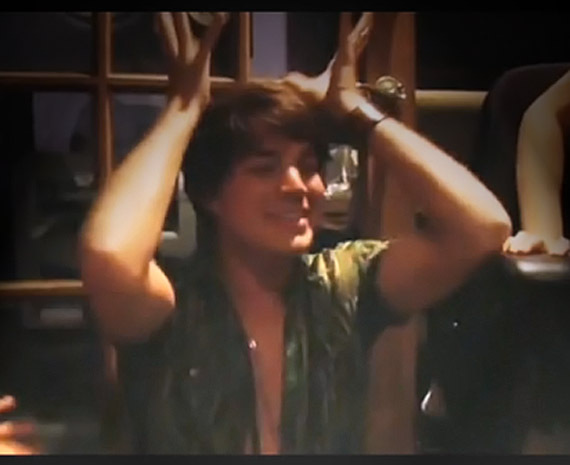 Well, that’s just a typical GLAMBERT, LOL. After the concert ended, I didn’t want to leave Adam. I wanted to be able to hang out with him, and get to know him personally. I realized how much I loved Adam that night, and he really meant a lot to me. As we were driving home, I started crying happy tears. I lay down with my picture of Adam right beside me. I couldn’t believe I actually got to see Adam Lambert in person, and I was extremely thankful for it. When we arrived home, I felt very tired, and I fell asleep instantly with my Adam picture right beside me again. I will never forget that moment, and Adam will always remain in a very special, glittery place in my heart. Every day at school or anywhere else, I’m always thinking about Adam, and I keep fantasizing about Adam’s Glam Nation tour! Whenever I’m bored, I draw Adam, and write his name all over my folders, and agenda book. Adam has made a huge impact on my life, and he’s helped me build confidence, and learn how to believe in myself since I never have before. I feel like I’ve become a better person ever since he came into my life, and he’s inspired me incredibly. I’ve always wanted someone to look up to, and now I’ve found that person. Adam is a special person, and he’s beautiful on the inside and out. He has learned to help me not care what other people think, and to always be myself. I love you Adam Lambert forever, xoxo. Glambert #48, thank you so much for your letter. Many of us have had similar experiences and I appreciate you sharing this! You rock! Please leave a comment or rating … need some feedback people! Love the Bill Video isn’t he the Cutest, My daughter is so IN LOVE w/Bill, He is Great in Concert saw him twice & they did a MEET &GREET in NYC was awesome to met the Band. Hoping Adam has a MEET & GREET w/ his concerts, any word about that?? CLYG Video Beautiful. Adam wants FIRE, I would LOVE to give HIM some of MY FIRE, Just come to My House Baby, the place is always on FIRE w/U always in my MIND! Well, I can’t EAT, or JUGGLE fire, ..what if it gets too close to my hair? I really LIKE my hair! OR dance WITH fire… well, maybe around a bonfire, sorta naked,wild Wiccan style..that might be fun:).. but I COULD possibly CATCH on fire pretty well!! Although I doubt that would help anyone much. Now, this is interesting, while I find Bill to be beautiful, with those very feminine features I see him as a beautiful woman. And since I am a very heterosexual woman he does nothing for me … even though I hear he is straight. This is all so confusing …. Kate, I agree with you. Bill is too feminine for me but since I’m not a gay male what do I know! However, I find Tommy appealing and attractive even though he is also somewhat feminine looking. 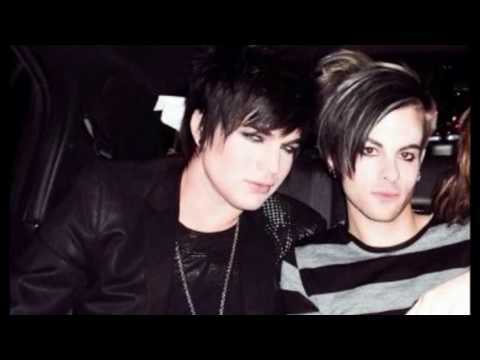 scores Tommy better, but Adam is Adam, he always praises others..